Although honey is one of the most important products of the bee, yet it is not the only product. Honey wax, propolis, nectar, bee toxicant are cases in point of other products that proved by experimental science to be of medical benefits. Honey has more than 80 materials of sugar vitamins and 15 materials of sugars, particularly fructose, glucose, minerals, amino acids and about 5% of unclassified materials. 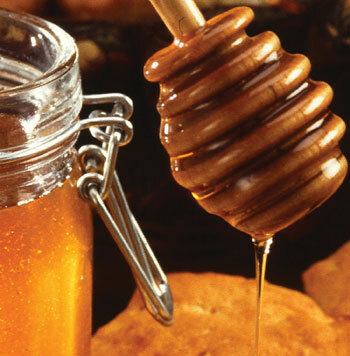 “Containing healing for mankind” is an explicit verse indicating that honey is a treatment as well as a nutrient. Benefits of honey: Alleviating inflammation of cornea if used locally on the eye. – Honey stimulates the re-growth of tissue involved in the healing process. It stimulates the formation of new blood capillaries and the growth of fibroblasts that replace the connective tissue of the deeper layer of the skin and produce the collagen fibres that give strength to the repair. -Thanks to its aforementioned antimicrobial property, honey provides a protective barrier to prevent wounds becoming infected. It also rapidly clears any existing infection from wounds. It is fully effective, even with antibiotic-resistant strains of bacteria. Unlike antiseptics and antibiotics, there is no impairment of the healing process through adverse effects on wound tissues. – Some studies showed that honey is a good treatment against the hospital infection bacteria “superbugs” (MRSA) . As honey does not accommodate bacteria, this bactericide (bacteria-killing) property of honey is named “the inhibition effect.” There are various reasons of this anti-microbial property of the honey. Some examples are: the high sugar content that limits the amount of water microorganisms need for growth, its high acidity (low pH) and composition which deprive bacteria from nitrogen necessary for reproduction. The existence of hydrogen peroxide as well as antioxidants in the honey prevent bacteria growth. Antioxidant: Everyone who wants to live a healthier life should consume antioxidants. Those are the components in cells that get rid of harmful byproducts of normal metabolic functions. These elements inhibit destructive chemical reactions that cause spoilage of food and many chronic illnesses. Researchers believe food products rich in antioxidants may prevent heart problems and cancer. Strong antioxidants are present in honey content: Pinocembrin, pinobaxin, chrisin and galagin. Pinocembrin is an antioxidant that merely exists in the honey. A treatment for involuntary urination at beds. Such a disease that could often be a result of psychic or neurotic cause. So, if the child is given one small spoon of honey before sleeping, this will have a positive effect, as honey is sedative for the nervous system, thus helping the cyst to relax and expand during sleep. Concentrated sugar also helps to absorb water from the child body. It supports blood formation: Honey provides an important part of the energy needed by the body for blood formation. In addition, it helps in cleansing the blood. It has some positive effects in regulating and facilitating blood circulation. It also functions as a protection against capillary problems and arteriosclerosis. A treatment for alcoholic poisoning. Honey is one of the main nutrients prescribed in hospitals and clinics of alcoholic addicts, as it protects the liver from alcoholic poisoning. Fructose and vitamin B group in the honey helps oxidize the alcohol remaining in the body. In cosmetics, a mixture of honey with lemon and glycerin is considered of the best old medical prescription for the treatment of skin cracking and roughness, the inflammation and wounds of lips, sun stroke, and dermal pigments. Many ointments and creams contain honey as a main element for the treatment of skin diseases. Many researches have been done to look at the benefits of natural honey .. ! It was narrated by Al Bukhari and Moslem on the authority of Abu Saeed Al Khudari that A man came to the Prophet Mohammad (PBUH) and said, “My brother has some abdominal trouble.” The Prophet said to him “Let him drink honey.” The man returned to the prophet and said: “O Messenger of Allah! I let him drink honey, but it caused him more pain.” The prophet said to him; “Go and let him drink honey”. The man went and let his brother drink honey, then returned back and said; “O Messenger of Allah, it did not cause him except more pains.” The Prophet then said, “Allah has said the truth, but your brother’s abdomen has told a lie. Let him drink honey.” So he made him drink honey and he was cured. It can easily be seen from this information that honey has great “healing” properties. This is undoubtedly one of the miracles of the Quran Allah, Who is Exalted in Power, has revealed. In the honey bee colonies where each of the many bees is assigned a specific task, the only exception is the male honey bee. The males do not contribute to the defence of the hive or its cleaning, gathering food, or making the honeycomb and honey. The only function of the male bees in the hive is to inseminate the queen bee. Apart from reproductive organs, the males possess almost none of the features possessed by other bees and it is therefore impossible for them to do anything but fertilise the queen. In Arabic, there are two different usages of verbs. By means of the usage, it is possible to determine whether the subject is a female or a male. As a matter of fact, the translated verbs into English (underlined words) used for the honey bee are used in the feminine verb format in the Quranic verses. Based on this, the Quran indicates that the honey bees that work in the making of the honey are females. We should not forget that it is impossible for this fact to have been known about the honey bees in the time of the Prophet Muhammad (PBUH). Yet, Allah has pointed at this fact and shown us yet another miracle of the Quran. Mash’Allah, I was not aware of all the qualities and benefits such a simple product as honey would have. I really enjoyed reading this information. It is good reference material. May Allah reward you for the research you did as an awareness to our health.